The Philippian Jailer: Does God Care Who Wins the Super Bowl? The small God of our cynicism. I have been a fan of the 49ers and the Patriots since I was young, having spent several early formative years living in those media markets. In 2011 2011 I also picked up a passing affinity for the Denver Tebows ... er, Broncos. Of course, that was the year that the Tim Tebow experiment emphatically stirred up the most predictable debate about faith in sports: "Does God care who wins a game?" "As a player, I never understood why God would care who won a game between my team and another. There were religious guys on both teams. If God gets credit for the win, does he also take blame for defeat?" Of course, it's easy to point out that Frantic Fran may suffer from the bias on one who lost all three Super Bowls he started in, but the larger point is that his observation seems to carry a ring of truth. A sporting event is not a binary event where God judges the more righteous team and grants it the victory. Despite the insinuations, no serious person--Christian or not--would argue such a thing. Certainly Brother Tebow never has. "I think Jesus might have more important issues on his plate: disease, maybe. War. Poverty." Here at last is the core of the issue. 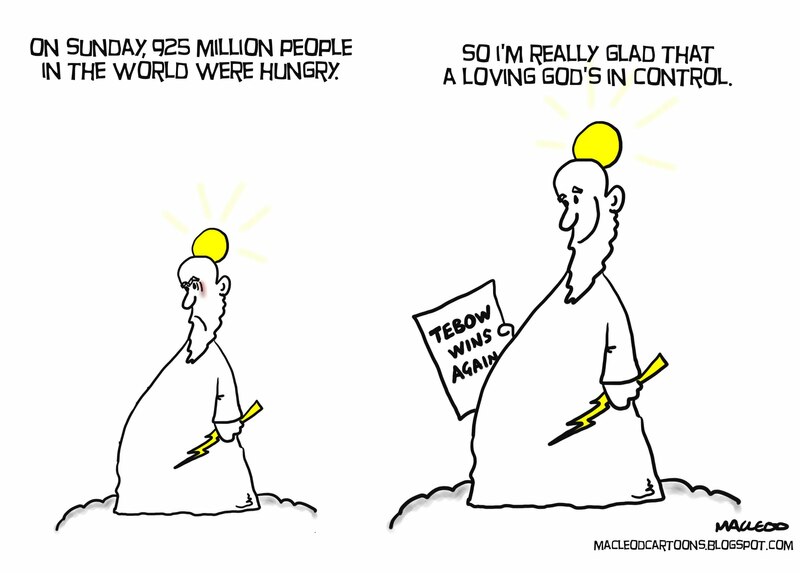 God can't possibly care about sports because He's busy with really important stuff. This sounds right on the face of it, until you stop to consider what that says about God. You see, He can only handle so much. Do you really expect Him to take time out from disease, war and poverty to flick on a football game? How ridiculous! Those who make such arguments are essentially saying that God is too big and important to worry about small and petty issues like football. The problem is that their argument makes God out to be very small indeed, for it presumes that God is unable to multitask. It assumes, in short, that God is like me ... finite, time-constrained and overwhelmed by "important issues". Like a divine circus performer desperate to keep a dozen plates spinning at once. This is not the God of the Bible. Our God is the author of history ... every part of it. Not just the Super Bowl, but the preseason. Not just my cancer, but my hangnail. He is the God who watches every sparrow and counts every hair on my head. The team who wins the Super Bowl will be the one which God purposes to win it. In so doing, He will give some an opportunity to glorify Him in victory, while other glorify Him in defeat. Many of His people on both sides of the final score will gain the opportunity to testify to His goodness, both in victory and defeat. Many will be subjected to trials of faith and emerge stronger, refined and purified. Through it all, God will be moving events toward His final judgment. 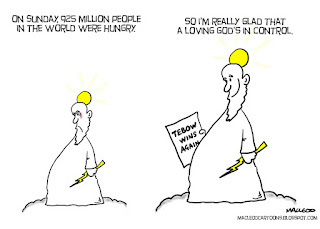 So does God "care" who wins the Super Bowl? Of course He does. Just not necessarily for the simple, carnal reasons we assume He might. Rather, just as "we know that in all things God works for the good of those who love him, who have been called according to his purpose", we know that God works out His grand design in sparrows and in football games. Some small number of His purposes are evident to us immediately, but most are not, in the same way that few of a parent's purposes are evident to a small child. "Who has known the mind of the Lord? Or who has been his counselor? ""Who has ever given to God, that God should repay them?" For from him and through him and for him are all things.To him be the glory forever! Amen. As for me, I plan to sit down and watch what I hope will be a great championship game. In other words, I will root my team in blissful ignorance of the eternal ramifications of a victory or defeat. This is so right, I don't care about the Superbowl but if you're talking about the current Six Nations games currently being played this side of the pond, that's different. God however is interested in both, as well as the problems of the world. I am in total agreement with the idea we have too small a vision of God, He is Infinite, able to do exceedingly abundantly more than we can ask or imagine. God is not a supersized, super stressed CEO, He is God; all knowing, all powerful, able to hear the cry of every heart & respond to it. It's one of the things I love about Him. There's a sense in which the question, "Does He care" is anthropomorphic: Probably most people who are asking are not asking if He's big enough to care, but whether or not it matters to Him if WE care. Some of that will turn on preferences. I know people who have no interest in sports who can only accept that ANYONE would care by being charitable. Granting that someone COULD care, they may then retreat to asking if they SHOULD: "Aren't there lots of better things you could be doing." If sitting on the couch and watching sports is pretty much all one does - ever - then there's a fair side to that question. But, if it's just a matter of watching Tim Tebow versus reading Jane Austen, things get more complicated. However, there is one issue having to do with choices and how we spend our time that ought to jump out in a Christian blog: The Super Bowl is played on Super Bowl SUNDAY. It's a controversial topic in the American church, I know, but, still, it's not just a matter of being "legalistic": If He tells us that, after giving six days to the work He has set before us, then, for our own good, we should set aside a day for Him, does He care if we watch the Super Bowl? So when can we expect the first post on the topic of the Sabbath, Presbyter? I first have to wrestle with years of double-mindedness: But our pastor has begun a series of sermons on the subject and the first was based on Isaiah 58. The emphasis in it has to do with the "positive" side - a day for fellowship with the Lord. I led a discussion on it, and had to take a bit of trouble to keep it from drifting off into the "negative" side (and we all know what that means) and found that even the effort to do that was helpful in focusing things on the message of Isaiah 58:13-14. Some people are too big to 'allow' God to decide which things He should probably attend to - those BIG problems that just don't seem to be getting any better. Surely He'd serve us all better by fixing all of His attention there. Sorry, if I'm a bit facetious. I should go to bed. Great post! We serve a sovereign God - full of grace and truth! "Neither party expected for the war the magnitude or the duration which it has already attained. Neither anticipated that the cause of the conflict might cease with or even before the conflict itself should cease. Each looked for an easier triumph, and a result less fundamental and astounding. Both read the same Bible and pray to the same God, and each invokes His aid against the other. It may seem strange that any men should dare to ask a just God's assistance in wringing their bread from the sweat of other men's faces, but let us judge not, that we be not judged. The prayers of both could not be answered. That of neither has been answered fully. The Almighty has His own purposes." I believe God has His hand, and His interest, in all things we do, but they fit His purposes in ways we may not fully understand until we see Him face to face. He has His own purposes, and He will be glorified. God bless, Jailer, and thank you for your service to our country. Regarding G-d and today's Superbowl ... To some extent, being a Texan living in Baltimore, I really don't care. However, this was shared from the pulpit this morning, so I thought I'd pass it along. Luke 12:24 Consider the ravens: for they do not sow, neither do they reap; for them there is neither storehouse nor granary, yet God feeds them. Of how much more value are you than the birds!